The .ost is a database file which gets created when Outlook application gets collaborated with Microsoft Exchange Server, allowing users to work on emails even if there is no internet connection using Outlook. You may encounter several problems when these OST files when they get corrupt or damaged or broken. The problems include inaccessibility, errors, unable to send/receive emails, etc. After such circumstances, the best option available for you is to reconfigure your Outlook all over again which sounds tiresome or convert the corrupt OST file into a healthy PST (Personal Storage Table). There are many reasons due to which an OST file gets corrupted and damaged, some of them include .ost file header corruption as a result of malware infection, interruption while synchronizing emails from Exchange server, sudden power failure while accessing OST file, upgradation of MS Outlook application from one version to another, database corruption, exchange server errors, application malfunction, etc. However, as said earlier that all these problems can be eliminated by safely converting the OST file to PST file format with the help of best rated OST to PST converter software like Remo Convert OST to PST. Remo OST to PST converter - The best software to convert OST to PST! Remo Convert OST to PST is one of the best OST to PST conversion tools which easily converts corrupt, damaged, inaccessible, broken or any normal .ost file into a valid/healthy .pst file. As the tool is equipped with strong algorithms, it deeply scans the corrupt OST file and converts it into a healthy .pst file in just a matter of minutes. 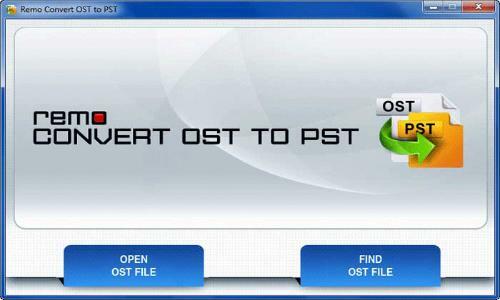 One of the better things about this best OST to PST conversion software is that, it works on read-only mode, which ensures no damage is made to the original OST file while converting your Outlook OST to PST file. Adding to this, the tool automatically recovers all lost / deleted Outlook attributes such as emails, contacts, calendar entries, note, RSS subscriptions, etc. after successful OST to PST file conversion. 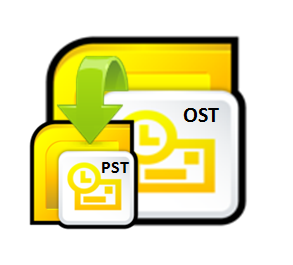 In short, Remo OST to PST convertion tool is the most reliable software for converting .ost into .pst file that is preferred by many users. 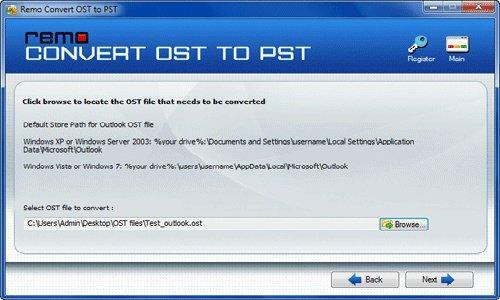 Remo OST to PST Converter also knows how to convert OST to PST in Outlook 2013, 2010, 2007, 2003 and Microsoft Outlook 2000. Step 1: Download and install the demo version of the best OST to PST converter. Launch the software and follow the main screen. Make use of "Open OST File" option to choose your OST file or click on “Find OST File” option to search for your OST file. Step 2: Use "Browse" button to locate the OST file which you want to convert and click "Next" to proceed further. Step 3: The next screen provides you the option to browse for the destination location to save the converted PST file. Click on “Convert” button to start the conversion process. Has the ability to convert OST file with password protection and encryption.